Hello and welcome to DCN Woodworking. 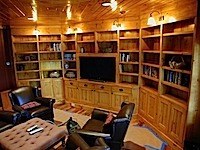 From our upstate New York shop we have been constructing and installing cabinets for over 25 years. Many fine homes and businesses throughout the tri-state area have called on us for their woodworking needs. Our work has been showcased in the June 1995 Architectural Digest as well as the January 2009 issue of Better Homes and Gardens. We are a small woodworking shop dedicated to providing custom cabinet's and furniture in a variety of styles and materials. Contemporary to reproduction and everything in between. Every piece is crafted to your exact specifications in the material of your choice. If you have a design you want realized, give us a call to discuss your needs. Please peruse the photo album and contact us if you need more information on your dream project.